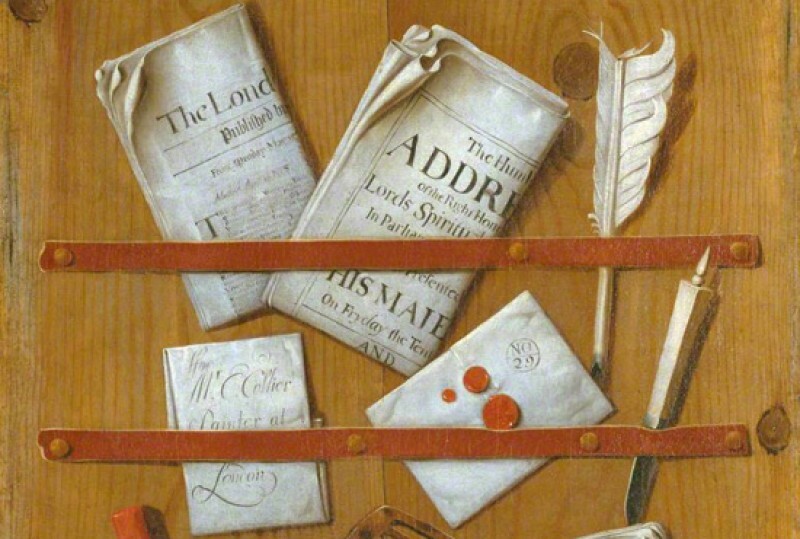 This illusionistic painting is intended to deceive the viewer into thinking it is a real necessary-board stuffed with objects held by leather straps. The type of painting is called 'trompe l'oeil', designed to 'fool the eye'. There is a pair of scissors, a little ivory magnifying glass, a frontispiece of an English play-text (Abraham Cowley's 'The Guardian', a Comedy performed for Prince Charles, later Charles II, in 1641 and revived as 'Cutter of Coleman-Street' in 1663), a large horn comb and a small ivory double comb, a knife, a shaving knife, some playing-cards, a pen-holder; a quill pen, a gilt-tooled leather-bound book, a cameo of a Roman Emperor (which refers to the artist's honour of Painter of the Holy Roman Emperor, bestowed on him by Emperor Ferdinand III in 1651), an envelope addressed to van Hoogstraten himself, a string of pearls, an envelope with a paper seal, and a bunch of keys. The artist, who came from Holland, was in England between 1662–1666 when the picture was painted.